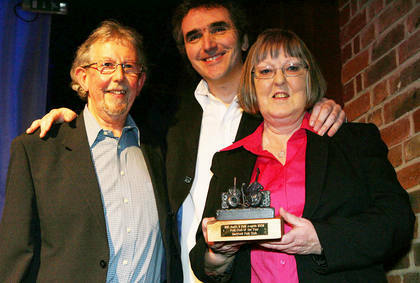 The trophy was presented to Pam and Alan by Jez Lowe on Monday 4 February 2008 at The Brewery in London. Alan Colls accepted the Award with a thought-provoking speech, which in some people's opinion, far surpassed the words of many accomplished speakers! Here is a transcript of the presentation recorded on 4 February 2008 and broadcast on the Mike Harding Show BBC Radio 2 on 20 February 2008. Well, thank you everybody. There’s a big list really of people to thank. 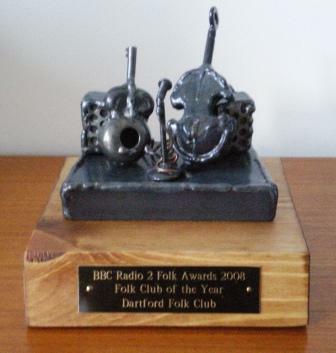 And this award, coming in this year, is really the icing on the cake for us because this year the folk club is 35 years old since Pam and I have been organising it… [applause] …It was going a long time before that as well, because I remember going to see Rambling Jack Elliott there in the Fifties, I think it was, and that sort of sparked our enthusiasm for the music. Just to say thank you for all the people that sort of help. We’ve got a good bunch of enthusiastic and great friends that help us to do it and we couldn’t do it without them. And, of course, there’s the audiences who come year in and year out and they are very important because it wouldn’t be here without them. And, they come along to see all these fantastic artists. We really do appreciate you. You spend nearly all day getting to the venue, you sort of write the songs, you sing the songs, you back the songs, you even tune your own guitars!… And, at the end of the evening, you’ve always got time for the audience, which is great. There’s one other group that I would like to… not forget, and that’s all the people who can’t be with us: the Alex Campbells, The Ewan McColls, the Steve Benbows and lots of people that set the foundation for this wonderful thing we call the British Folk Scene. Thanks very much. [Cheers and applause]. Jez Lowe there, presenting the Folk Club of the Year Award to Pam and Alan Colls and Dartford Folk Club at the Folk Awards this year. Messages of Congratulations Comments from a few of our many supporters! 8.30 P.M. - 11.00 P.M.